Kyle recently completed a commission from a stained glass company for a large window. 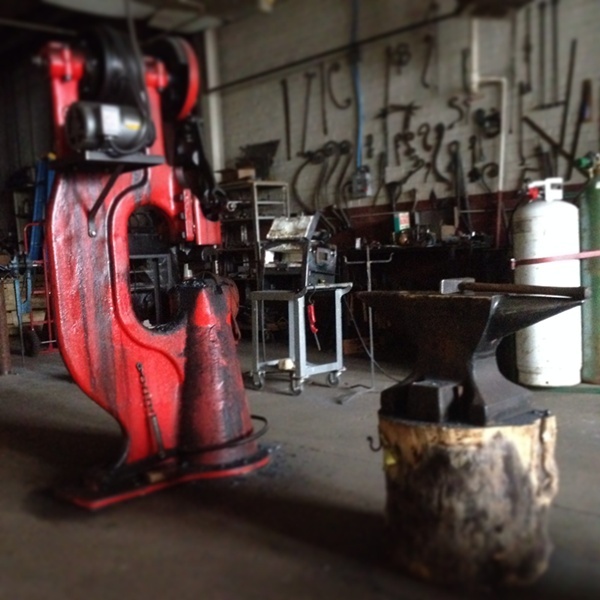 While the work wasn't fancy, it did require the skills of a blacksmith to bring it to life. 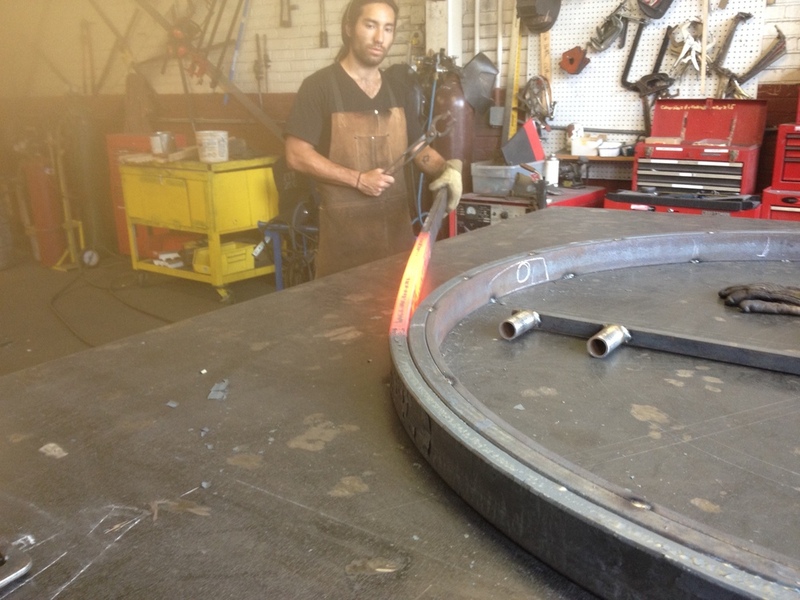 The first section we needed to make for this arched window was a tight curve from thin-walled steel tube. Modern tube benders would distort the shape of the tube. A thicker walled tube would give the window a rounder edge than we were looking for. To get the right look, we constructed the top arch by laminating several layers of rectangular tube, which we pulled hot around a steel form. My assistant Matt helping me pull the last course of rectangular tube for the arch. The three layers of curved steel, still warm from the bending process, clamped together to cool. The upper mullions posed another challenge. The T bar material used to make them can be rolled on a modern roller, but that process requires an expensive set of custom dies, and like the tube steel for the arch, would distort the material. Our solution was to create our own tooling. I love making tools! 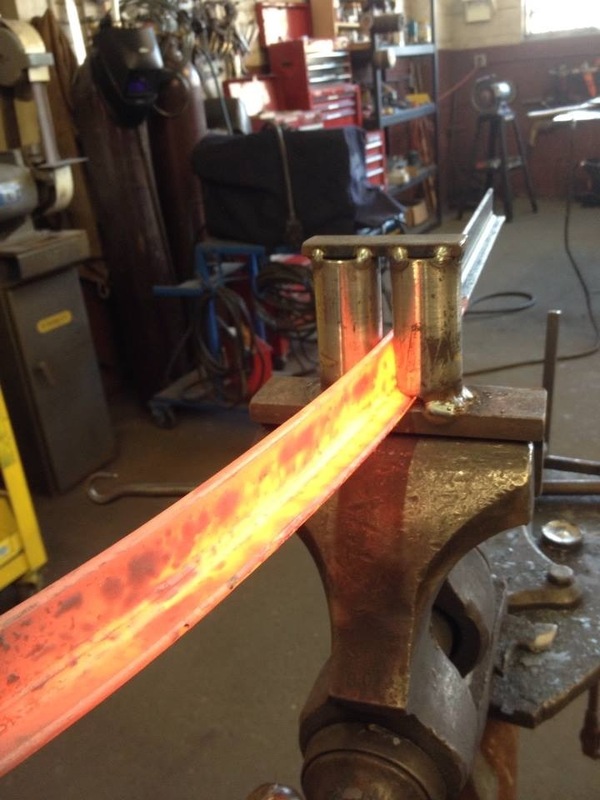 This is the T bar bending apparatus I made to help us get the job done. Top arch is done! Now for the bottom. This puppy is so big, it took not one but two assistants to get it cleaned up and ready to go. Off to the sandblaster before we paint it. Thanks Kallen and Matt for all your help!